Today: Winds: Southeast 5-15 kts. ; seas:Choppy; waves: 2-4 ft.; isolated showers. Tomorrow: Winds: N/NE 5-15 kts. ; seas: Light chop - choppy. 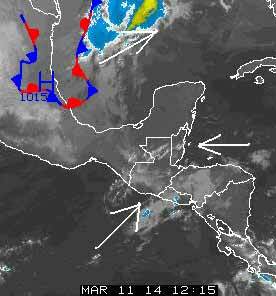 ; waves: 1-3 ft.; isolated showers. Marine Outlook: Wednesday night:- winds: N/NE 5-15 kts. ; seas: Choppy. ; waves: 2-4 ft.; a few showers. General Outlook: Through to Thursday morning: Becoming cloudy with a few showers as a cold front approaches the country. Nice beginning of a good day on Ambergris Caye. With an expected high of 86 this sunny day should also please a lot of tourist on the island. Looks like a dry day. Little or no cloud this morning, but puffy clouds will build up later. . . .Occasional high level cloud crossing from the SW I don't see any effect from that collapsed cold front.